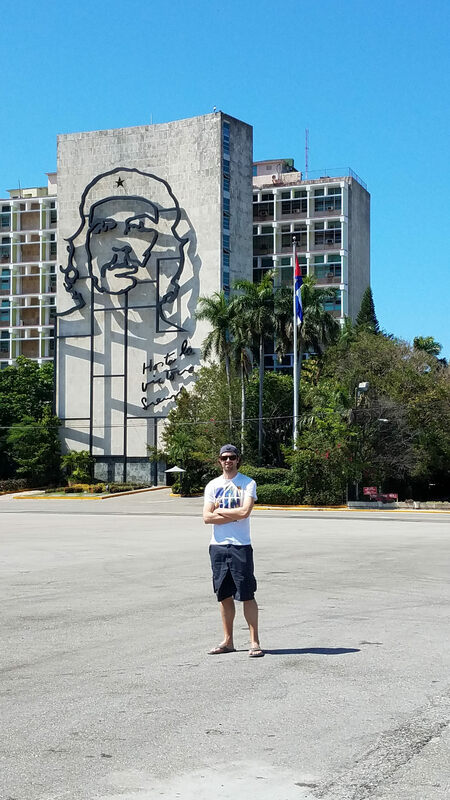 As a wide-eyed American youngster, I never really expected to experience the streets of Havana, the fumes of Matanzas and the pervasive propaganda of la Revolución. I was always strangely drawn to the weirdness of Castro’s Cuba. I wondered what was down there, why we couldn’t go there and what we’d experience if we actually strolled around the place. I didn’t really know the details of what led to the various embargoes and travel bans, I just thought that Cuba must be a scary place. 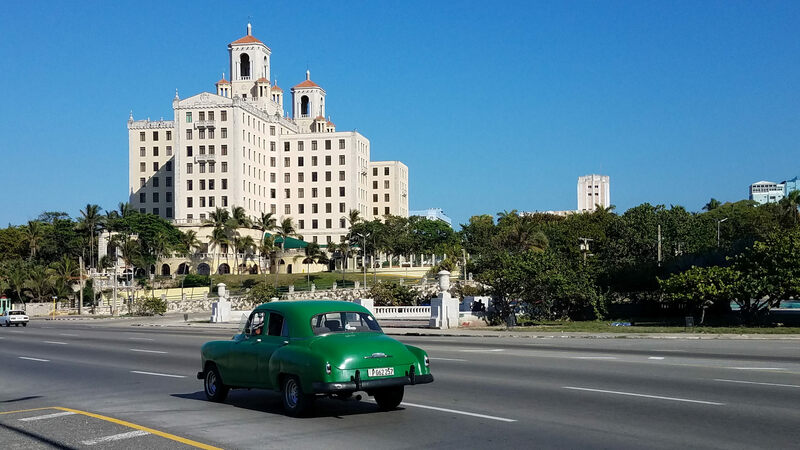 In today’s far stranger society, Americans can fly right into Havana without much ado (sans signing off on our intentions beforehand – I ticked the educational box and have the itinerary to match). 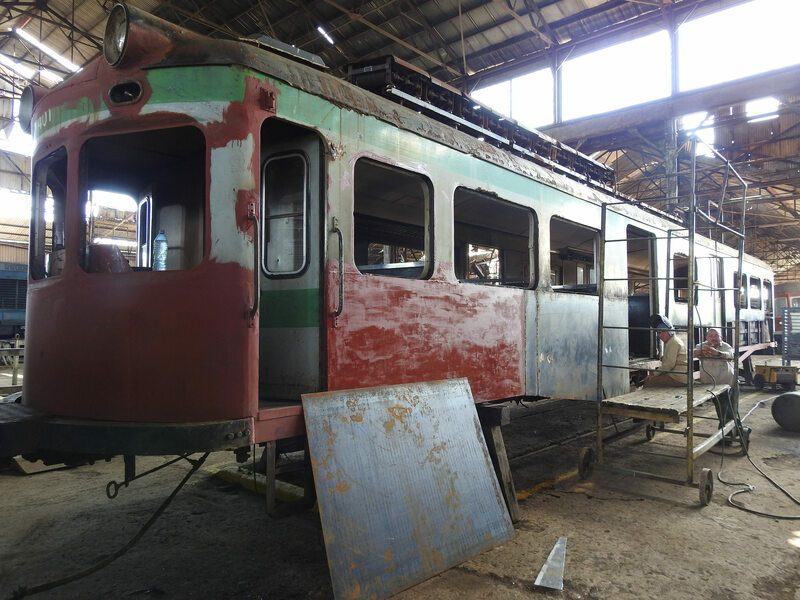 The walls built on the backs of bellicosity have crumbled in recent years, opening up the doors for curious American travelers and new investment opportunities in Cuba. In turn, this all seems to be well received by the Cuban populace, who now have been granted access to private (if heavily taxed) business that tend to cater to the relatively fledgling Pan-Cuba tourist industry, an sector that once was more concerned with selling the country’s beach resorts to tourists from Europe and Canada. I’ll admit, I had a few jitters flying into a country I wouldn’t have been easily allowed to visit even two years ago. I had some idea of what to expect based on my own research, but until you get your feet on the ground, you’ll really have no idea. That’s the beauty of travel, which truly is the ultimate hands-on lifelong learning tool we have. 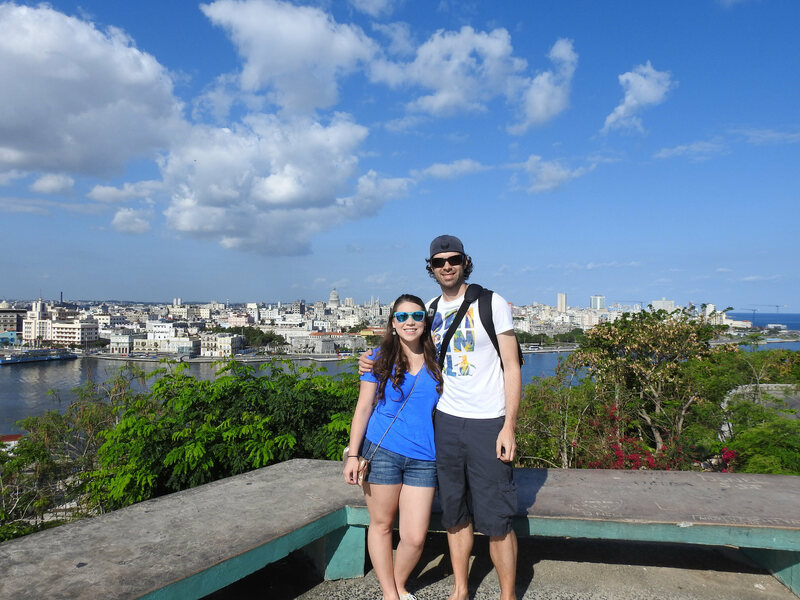 Breeah and I with the Havana skyline behind us. What did we find down there? How about a nearly completely literate and well-educated population that walks around with a healthy dose of pride and apparent optimism. Cubans are just as interested in you as you are in them and they seem to separate the individual from government. They don’t “hate” the U.S., but actually find our society quite fascinating. There are things in Cuba they definitely don’t like. They may not shout those ideas from the largest hills in Havana, but they will open up as you may open up in any friendly conversation. People don’t make much and yet a great majority of them find a way to dress fashionably and to the nines. Restaurants, whether a private paladar or state-run, are arranged and decorated with great care and attention to detail. 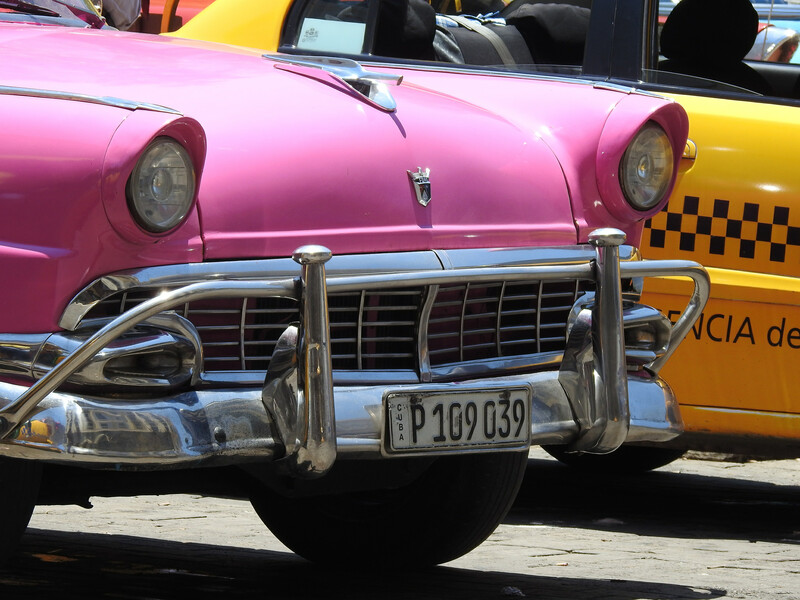 Those classic American cars are a labor of love for the Cubans, who have managed to keep the “Yank Tanks” beautiful on the outside and humming on the inside (cobbled together with parts from Russia and elsewhere). One thing that the travel ban surely accomplished is to drum up irrational fears. I’ll tell you this, if you’re hesitant about visiting Cuba because you feel unsafe – toss that idea right out. I felt safer walking around Havana than I do in many American cities, and I am generally a very cautious person. One side effect from Cuba’s long and strange history under the Castro’s is that the general population has no desire to have a brush with the law. Your biggest fear may be riding in a 50’s Chevy sans seatbelt. You’re as likely to get jumped in Havana as Des Moines. 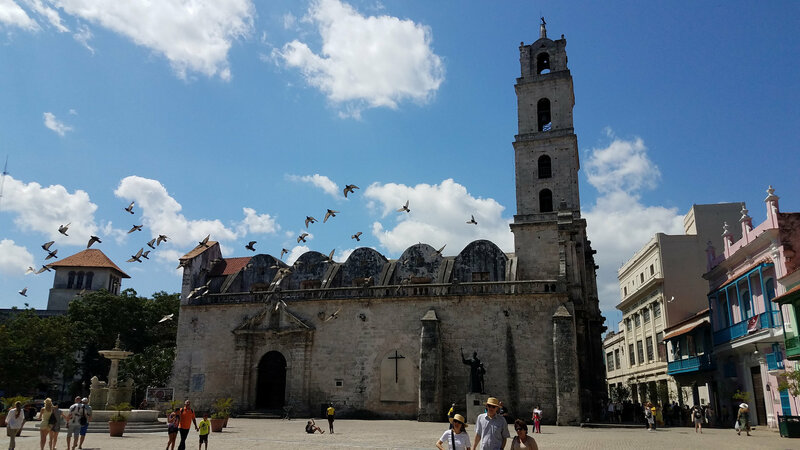 The biggest thing to watch for is money exchange schemes that take advantage of tourists unfamiliar with Cuba’s two currencies (the lower valued “local” currency, the moneda nacional, and the Cuban Convertible Peso, the money that is generally twinned with the U.S. dollar). Brush up on the logisitics of Cuban currency and you’ll easily avoid any potential trappings there. 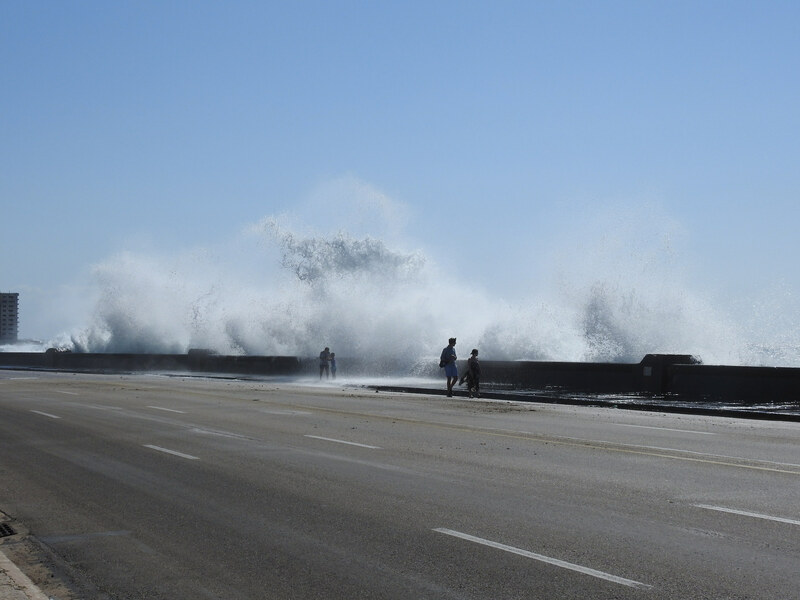 Walking along the historic seafront – the Malecón – feels almost otherworldly. Local cubans fish from this wall (though I never saw anything being caught), find dates and fall in love at night along the walkway or soak in the cooling mist or spray from the waves crashing near, on or even over the wall. Despite my initial skepticism that a beach would make for a more idyllic setting, I quickly grew to love the Malecón and actually kind of miss it now. Old Havana is an absolute charm-and-a-half. The World Heritage site boasts a number of incredible structures built during the period of Spanish colonialism in the 16th and 17th centuries and, incredibly, they have held up quite well (and many have been recently rejuvenated). Old Havana gives off a true European nostalgia, maybe moreso than the old towns of San Juan or Santo Domingo. This place lives and breathes culture and you feel like you are walking through the pages of history here. 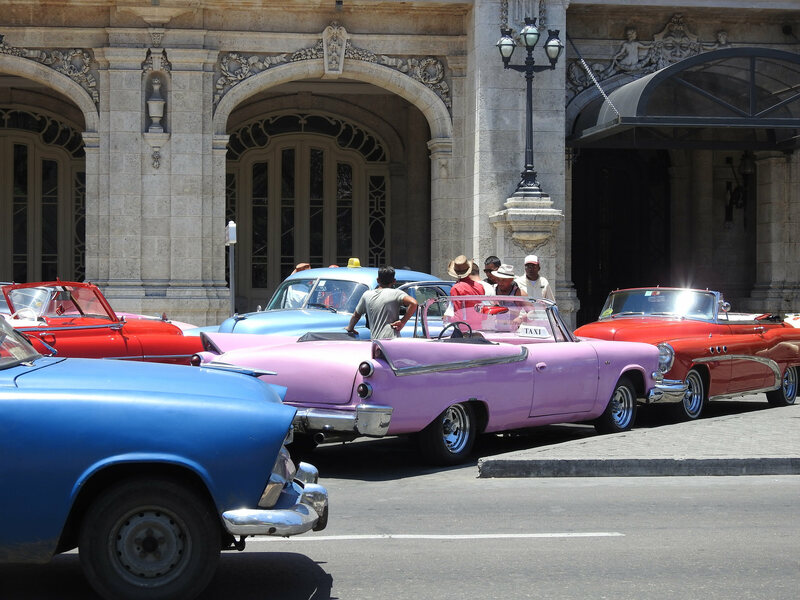 Havana is a throwback in many ways, heck, all of Cuba is. From the classic cars to the old world buildings and dearth of dominating modern structures to the relative lack of modern technology (yes, there is a way to get on the internet, use a cell phone or watch TV, but you’ll probably find it either cumbersome, too expensive or just not worth the logistical hurdles – put that phone away unless you are using it as a camera). I took some photos that resembled the 50’s in pretty much every aspect, a sorta HD look into a world that I’ve only seen before in Kodachrome. Therein lies the potential tragedy of investment. 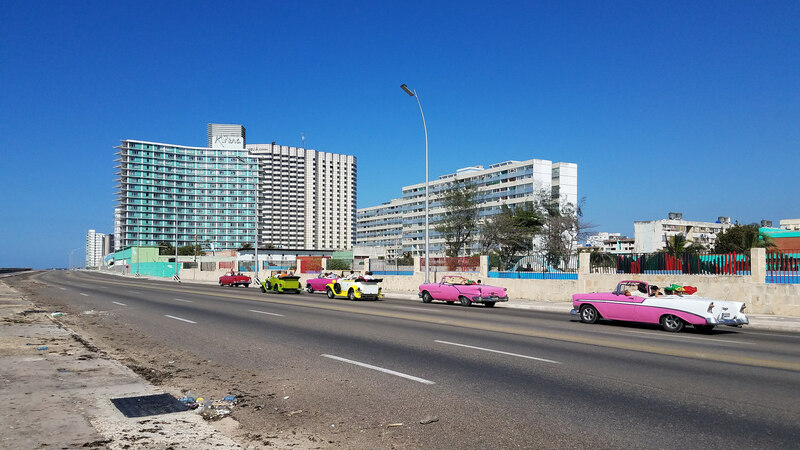 Do the Marriotts and Sandals of the world buy up parcels of land, tear up historic structures and change the humble skyline of Havana as we know it? Or does investment prop this classic place up for the long haul, preserving its past for many future generations and holding close its authenticity, its real selling point? Heck, all of Cuba (sans Guantanamo Bay) has nary a chain restaurant – but that is surely likely to change. Our trip actually extended out of Havana. 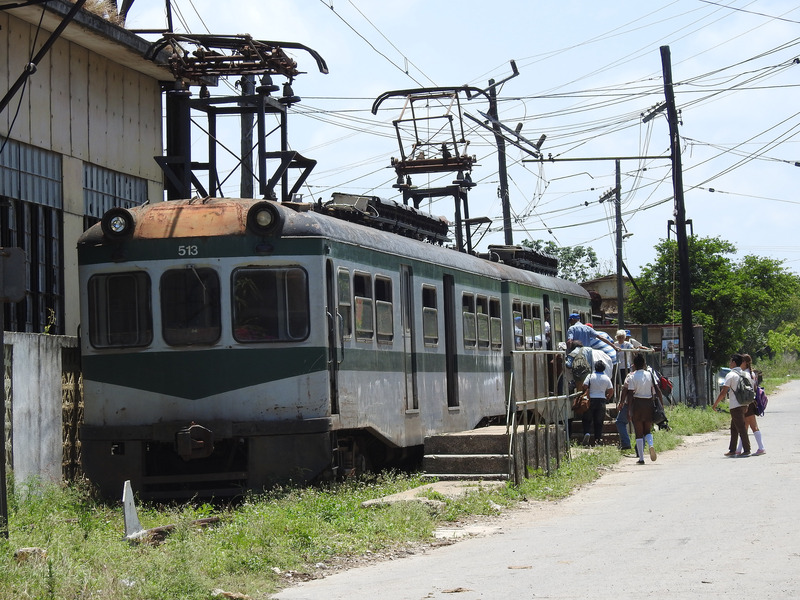 We hired a guide and a driver who took us to Matanzas, a smaller city that sits some 60 miles to the east (Elián González, the boy who was famously sent back to Cuba in 2000, recently graduated from the university there). 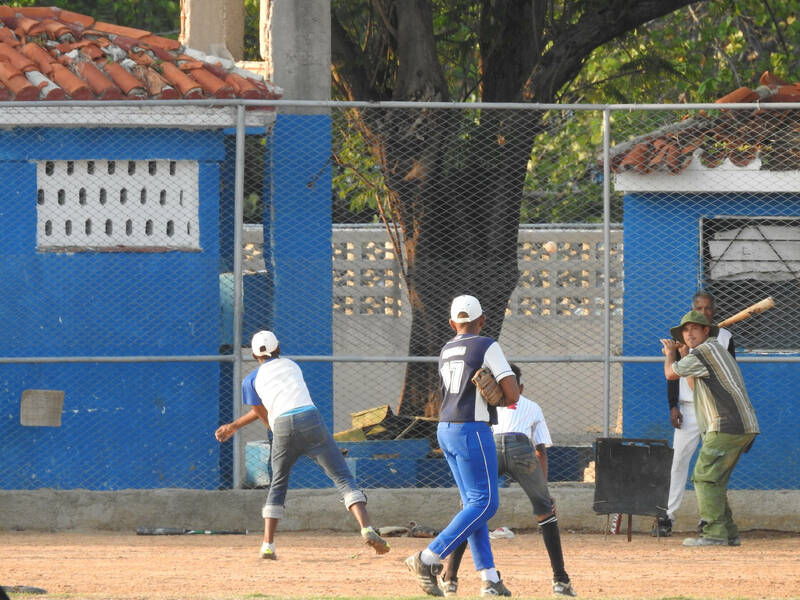 Matanzas could be labeled as the “real” Cuba – or at least thats how our guides tell us. Crowded rows of housing line the exhaust-fume riddled streets (emissions are likely not up to standards we are used to). There is an authentic noisiness and bustle in Matanzas, the short one person-sized sidewalks doing their best to contribute to the crowded nature of the city. Gone were most the tourists – I didn’t spot one while we were there. We toured the nearby Bellamar Caves, a national Cuban attraction since the 1860s and a very well-done, if short, cave tour. 90% of the tourists in our group were Cuban. We drove back through Camilo Cienfuegos – once known as Hershey (yes, that Hershey) and had lunch at a place that I couldn’t even find a reference to online (E2 Entre Dios, a paladar just south of Hershey in a small town the guides referred to as Cumin). We got a sorta-Hawaiian pizza, served on a soft, bready (think Boboli) base with a spaghetti-like sauce piled high with pineapple and chunks of ham and shredded cheese. We admired the attempt at a Hawaiian pie and it actually wasn’t bad at all! I read somewhere before going to Cuba that you’ll visit with many questions, and leave with even more. You may not find the answers, but seeking them makes for the adventure itself. A good friend of mine recently shared similar sentiments about Cuba, highlighting its rich culture. For me those classic cars are a big draw, too. And I’m glad you gave a suggestion of being less concerned about getting Wifi and cell service and rather just taking it all in the old fashioned way. I need to take that advice more often – I think we all do. Thanks for sharing. Thanks tyson – I think the cars are a big draw for most. Coupled with the architecture, it all sets a scene from the past that you won’t get anywhere else.